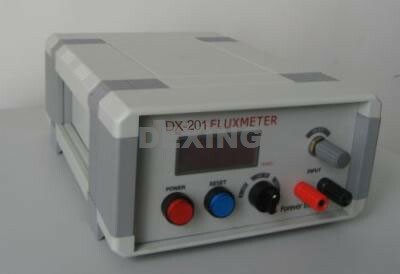 DX-201 digital fluxmeter is a precise magnetic measuring instrument, adopted low drift electronic integrator design and production. The most important features are test response quick, without data lose in the testing process. In the process of test samples flux by the Czochralski method, fast pull and slow pull datas are consistent, fine features especially shows in repeated measurements and regression testing. It can measure magnetic flux or magnetic moment matched with different fixtures according to users’ requirements. it adopts a high input impedance circuit design, affected by the test coil resistance is very small to ensure test accuracy. 6. Operational environment: 0 ° C to +50 ° C, Humidity: 35 to 80%.